Summer Book Bingo -- for grown ups! Stay tuned for Summer 2019 Book Bingo! And that’s a wrap! 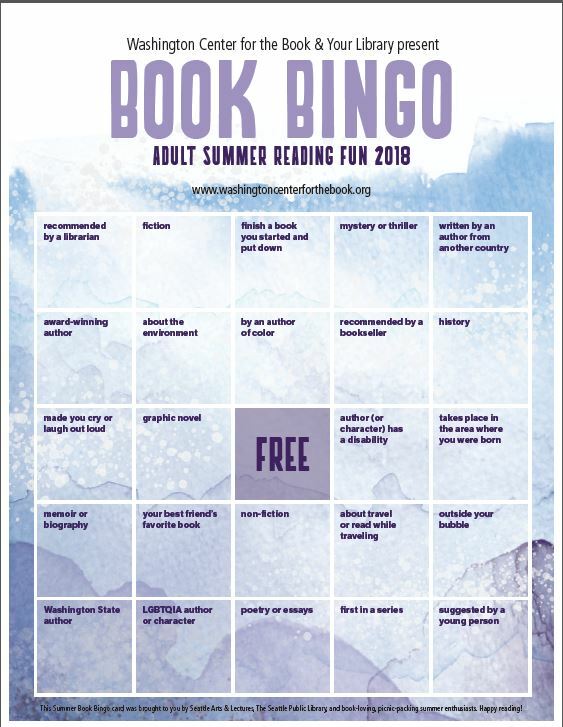 Here’s the Book Bingo card from Summer 2018: Here’s an adult summer reading program idea that takes little to zero staff time — but makes readers extremely happy! We’re hoping you’ll use this Summer Book Bingo card and make it available for your library patrons. We’ve kept the back blank so you can add information about your library, special events, programs, and reading suggestions. Download a PDF to print here. This Summer Book Bingo card is adapted from a successful program that the folks at The Seattle Public Library and Seattle Arts & Lectures have been doing for the past four years. Readers report how much they look forward to it each summer and how they like the challenges of different squares. We’ve also heard from library staff that it’s a great way to get conversations started about books and reading. We hope you print some of these out and make them available for your library’s patrons!